It’s spring, the weather is warm and the skies are blue. Why no progress on the boat? Mexican beach scene. The water was inviting, but what would happen to my little boat? Well, I have an excuse. I just returned from a six week trip to Mexico. After a year of planning and several years of saving, we rented a small apartment in Xalapa, a mountain city not far from the Gulf Coast. It’s one of the perks of self employment; wherever there is Internet, I can have my office. Distance and national boundaries are irrelevant in an era of email, Google and Skype. So once our travel fund grew large enough we headed south. We had a wonderful time and the weeks passed too quickly. But I was missing out on some prime boat building weather. After a horribly cold and snowy winter, it was irritating to learn that Pennsylvania started enjoying unseasonably warm weather within days of our departure. I didn’t regret our trip, but I couldn’t help think about all the progress I could be making back home. And a small dose of guilt emerged as friends and relations starting asking if I had stopped building the boat altogether. To reassure myself that I still cared about sailing, I spent free hours looking at boat building Web sites and assorted blogs. And what I saw reminded me that wind, water, and sails could still make my heart beat faster. Most inspiring was an account of a young family’s three month trip through the Caribbean in a simple plywood boat designed by Jim Michalak. While we were in Xalapa—which is a lovely city despite the rain–Garth Battista, his wife and their two young children were dropping anchor in one pristine, uninhabited bay after another and posting gorgeous photos of sun-drenched beaches, coral reefs and transparent water. Their boat, a 32-foot Cormorant, is twice the size of my Pocket Cruiser, but no more complex in its construction (as far as I can tell), which led to many quiet promises that my next boat will be large enough to take me to the Caribbean. But for all my building and all my reading, sailing remains a remarkably theoretical activity. I dream of venturing to distant ports, yet I have almost no experience with blue water sailing. 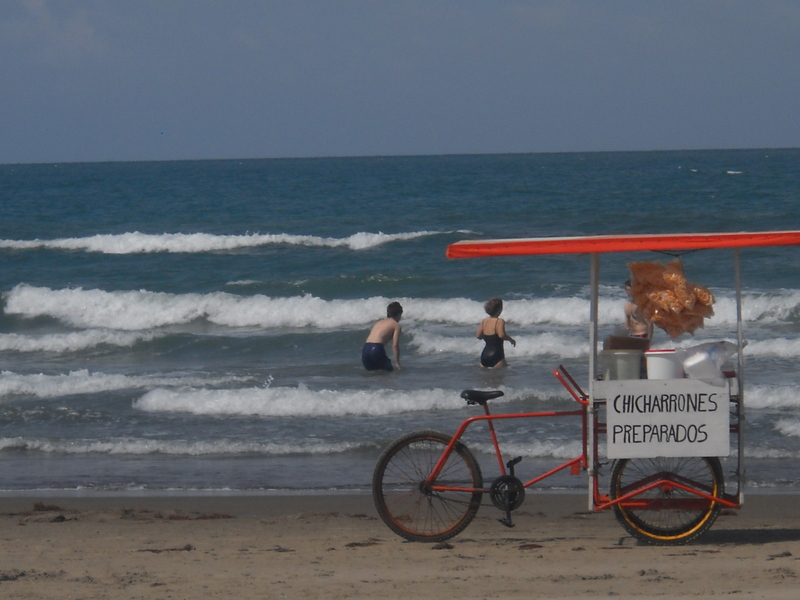 I was reminded of the disparity between fantasy and reality as we completed our Mexican sojourn by touring the Gulf Coast north of Veracruz. This part of Mexico is remarkably undeveloped and entirely lacking the kind of tourist infrastructure found in Cancun or Puerto Vallarta. Most of the time, we were the only foreigners at the small hotels we visited—which suited us just fine–and at one particularly isolated hotel, we were literally the only guests. This left me with lots to time to wander empty beaches and contemplate the sea. And what I often found myself thinking was: My God, those are big waves! Buffeted by strong winds even on sunny days, I thought for the first time about the tremendous power of the sea. Waves rolled ashore with relentless force and when we wandered into the water I could feel the current pulling me northward. It was perfect of body surfing, but what would it do to a tiny Pocket Cruiser? My flat bottomed boat would capsize before getting past the surf, I speculated, and even if it wasn’t swamped, the powerful winds would surely knock it down if given half a chance. I knew my boat was small, but for the first time I truly appreciated just how small it really is. It represents many hours of labor, but the ocean doesn’t give an A for effort. Pensively, I would walk back to the hotel. Of course, my Pocket Cruiser isn’t designed for the open ocean and my goal remains an inland cruise down the more protected portions of the Chesapeake Bay. But I came home slightly humbled by the seriousness of my undertaking. Building is a lark, but sailing is no joke. But the question remains: When will I finish my boat? Well, we returned home earlier this week and the first order of business was mowing and weeding (suburbia survival tip number one: Americans would rather live next to Osama Bin Laden than a neighbor with long grass). With those tasks completed, I am finally able to think about the boat and today I made a symbolic start to the boat building season by cutting a few stringers for the cockpit seating. An hour’s worth of work doesn’t make up for a month’s absence (or deserve specific discussion here), but I hope that it will be the start of a productive few week’s of work. Stay tuned! 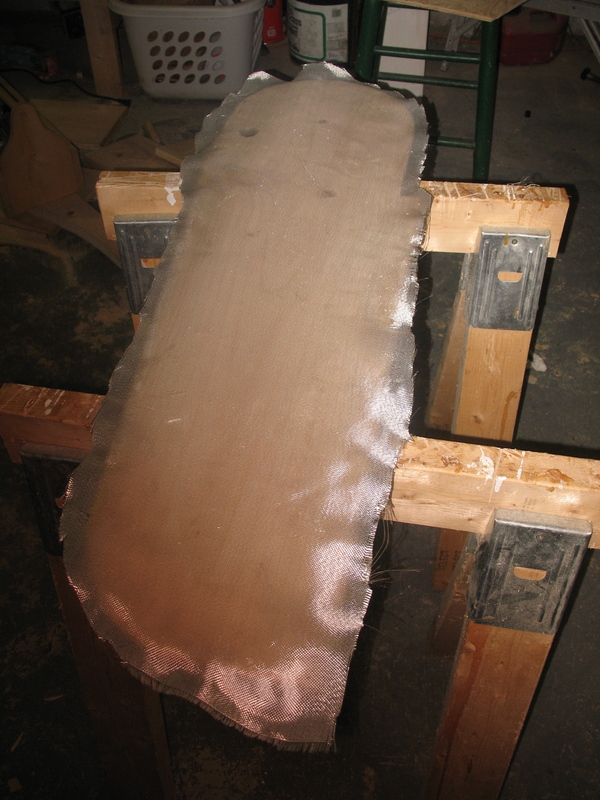 From the moment I resolved to build a plywood sailboat, I dreaded the day when I would need to fiberglass the hull. I knew nothing—absolutely nothing–about the process, but I assumed that it would be hard and stressful. I would have paid money to avoid the whole problem. I’m not the only one. Over the past year, I have read many pleas on various boat building forums from guys who are eager to build a boat, but hesitate when they learn that fiberglassing is required. Is it really necessary? They ask. Can’t I just skip this step? Eavesdropping on the conversations of experienced builders didn’t help much. They talked knowingly about “plywood saturation,” “faring compound,” and the superiority of epoxy resin over polyester, among a dozen obscure steps and specialized products. For a while I doubted my ability to ever crack the code. But slowly, as I followed online discussions, read the most popular books about “instant” boat building, and hunted down instructional videos, the clouds slowly parted. I began to understand both the how’s and why’s of fiberglassing. And here’s what I learned in a nutshell: Fiberglassing is nothing more than covering the boat with a layer of fiberglass cloth and several coats of epoxy—the same two part epoxy I use to assemble the boat. This process encapsulates the wood, providing another layer of protection. Well, that’s not so hard, I think. But I also learn from my readings that the process of applying epoxy over the cloth is fraught with many small hazards. The epoxy needs to saturate the cloth, for example, but not be applied too thickly and it’s important to work fast. If the builder works too slowly or tries to cover too much territory at one time the epoxy can begin to harden before it is evenly spread over the cloth. My anxieties returned when I read message from a guy who was trying to give away a partially completed boat after he botched (or felt that he botched) a fiberglassing job. It should be noted that not all builders fiberglass the entire hull. Dynamite Payson’s popular books on “instant” boatbuilding tell builders to simply “tape” the seams, which means that narrow fiberglass tape is epoxied over the edges alone. The same approach is followed by designer Jim Michalak. Both men believe it makes sense to fiberglass a boat’s bottom for extra protection, but this is offered as an optional step in most cases. The rest of the boat is simply protected by paint. This minimalist approach is appealing and, were I building a Payson or Michalak boat, I would unhesitantly follow their instructions. However, it is also widely agreed that exterior grade plywood will almost certainly start to check if not fiberglassed. Michalak uses exterior grade for all his boats, so I don’t know how he reconciles this problem; maybe “checking” is not a horrible thing. But many other builders argue that unless expensive marine-grade hardwood is used a plywood boat simply must be encapsulated with fabric and several layers of epoxy to prevent checking and forestall rot. The Stevenson’s usually follow the most expedient route, but not this time. For whatever reason, the Pocket Cruiser’s instructions call for glassing the whole exterior of the boat with one layer of fiberglass and two coats of epoxy. The accompanying video shows designer Pete Stevenson covering the underside of the boat, then flipping it over and doing the topside and cockpit. It looks like he did the whole thing in a single day. But my hull wasn’t ready for the full treatment and, besides, it was still winter and the garage was too cold for epoxy, which prefers temperatures above 50 degrees to cure. But it occurred to me that I could pass the time and gain some skills by fiberglassing my recently completed rudder and hatch cover. But pieces could be easily replaced if I made a mistake. Also, I could complete the work in my cellar, which was considerably warmer than the garage. I reread all I could find about the actual process of fiberglassing and learned that there are several different ways to get the job done. Glen-L, a well established company that sells boat plans and boat building supplies, tells builders to first cover the wood with a coat of epoxy. After it dries, the fiberglass is laid on top and coated with a second layer of epoxy. On top of that are added two more layers. Their instructions advise builders to apply each coat as thinly as possible and sand between coats. In contrast, Jim Michalak, in his book, Boatbuilding For Beginners (and Beyond), recommends spreading a thick coat of epoxy, then laying the fiberglass over top before the it dries. Once the initial layer hardens, a second thick coat goes on top. After sanding the rough spots, you’re all done. But I decide to follow the recommendations of West System, a well respected epoxy manufacturer. Their strategy, described in a short online video, is to first lay the fabric on the bare wood and then pour a small amount of epoxy on top, which is then spread around with a flexible rubber spatula. Once dried, two or more coats are added, with light sanding between each step. I’m sure experienced builders have strong opinions about each strategy, but I decided that West System’s approach made sense. It is also close to what the Stevenson’s recommend in their instructions. Plus, I was inclined to trust the recommendations of an epoxy manufacturer and I appreciated their clear presentation. So taking a deep breathe I cut off a strip of fabric with my wife’s fabric scissors, making sure that was large enough to drape over the rudder’s edges. The three-ounce fabric looked a bit like fine cheesecloth and cut as easily as thin cotton fabric. I laid the cloth over the board, mixed a batch of epoxy and poured a small amount in the middle. With a rubber-like paddle (sold for just such a purpose), I started spreading the epoxy around and pushing it into the weaving. As I worked, the white fabric turned pale and then became nearly transparent, a sign that it was fully saturated. The work was easy and the fabric stayed in place. So far so good. My trouble began at the edges. Using a small bristle brush I was able to stick the fabric to the sides, but the epoxy kept dripping and the corners didn’t want to stay down. I could tell that the work was flawed, but the full extent of my inexperience wasn’t revealed until the next day when I examined a rudder trimmed with hardened drips and multiple air pockets. It looked like a mess. I cut away excess fabric with my pocket knife, which helped tidy it up, and then smoothed everything down with my belt sander. Such a wonderful tool; it can remove a multitude of sins. I flipped the rudder over and repeated the process, trying hard to keep everything drip-free. Again, the top was easy and the results flawless, but I had the same problems on sides. I wondered if bumpy and lumpy edges are to be expected. Or maybe it’s the cold weather, I mused. Since it takes hours for the epoxy to kick, it has more time to run. Once again, I felt like I did when I first started building the boat—plowing ahead but never certain that I was doing it right. My confidence was somewhat restored as I applied additional coats. After the second layer, the fiberglass was almost completely invisible and the rudder took on a deep, glossy sheen. By the third coat, it looked nearly impregnable. I decided that while my work wasn’t perfect, it was certainly adequate. I had just enough time to finish the hatch before the weather turned cold, and I’m glad I did. I was able sit through the winter storms knowing that, when spring finally arrived, I would be able to pick up where I left off and have one less thing to worry about.